I have been dabbling with communication models (such as the 3-culture model). I thought the basic appearance could be applied to cultures and interaction of cultures. I am very open to thoughts on this. 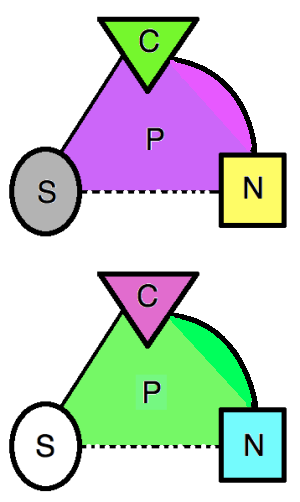 Figure 1 shows two people groups. “P” stands for a people group that can be characterized by its unique real setting, unique culture, and unique society. “N” stands for the natural or real setting of a people group. This could involve its geography, its local weather, and other aspects that we would not consider to be subjective. “S” stands for the society… the social bonds in a society. To some extent one can think of society in terms of institutions and laws. The people group triangle is always changing in shape since the natural or real world is always in flux. Likewise, the natural world affects culture and society and is ultimately affected by it. Culture is the lens through which people understand/interpret the world around them. People in society affect the world around them based on the perception they have from culture. This is why the natural world (N) and culture (C) is connected by a solid line. Likewise, culture (C) is connected by a solid line with society (S). The interaction between the natural world and society is typically indirect (via culture) that is why a dotted line connects (N) and (S). I have chosen to show the line connecting the natural world (N) and culture (C) with a curved line. I would love to give some clever reason for this. However, I really want to show that the relationship between culture (C) and society (S) is different from relationship between culture (C) and the natural world (N). This is because the natural world is not so much a human construct… certainly far less than culture and society.